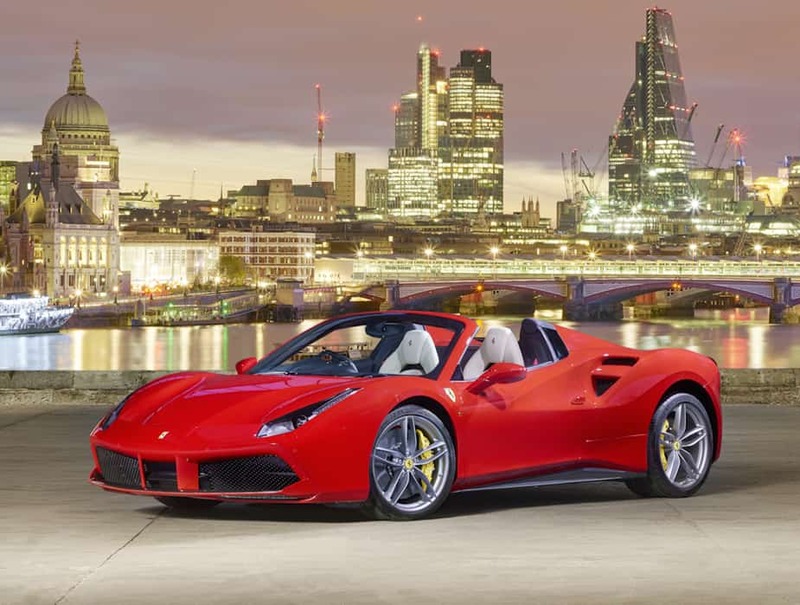 The Ferrari 488 Spider is the latest chapter in Ferrari’s on-going love affair with open-top V8 sports cars. 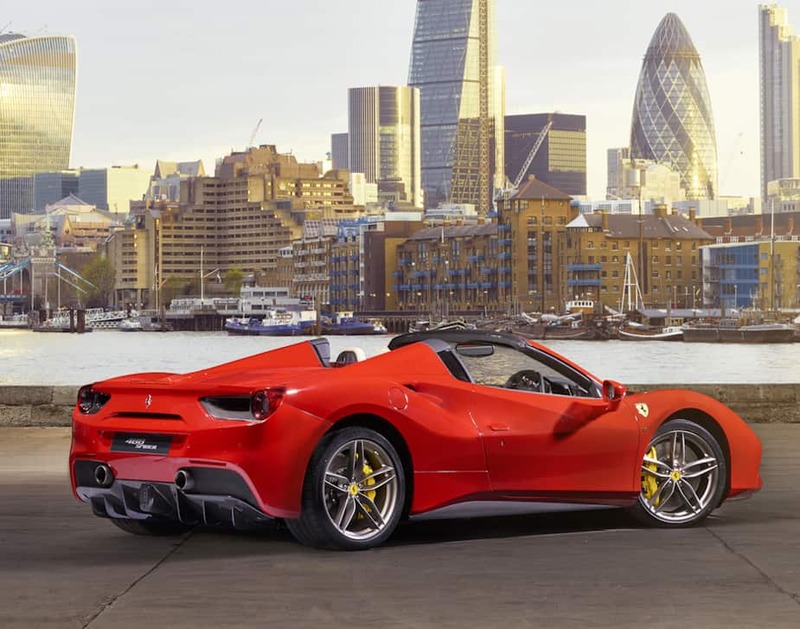 Starting with the Retractable Hard Top, around which the entire car was developed, every area of the Ferrari 488 Spider has been designed to set new technological benchmarks for the sector. The result is the most powerful and innovative Ferrari Spider ever built. The 488 has classic Ferrari mid-rear-engined sports car proportions: a short muscular front wing into which the bumper is wedged which lends the whole front of the car a sense of power and speed, and immediately draws the eye to flanks featuring new side air intakes for the intercoolers. The motif of the subtle crease line that forms the scallops on the door leading to the intakes is a nod to the 308 GTB. The front is characterized by a single grille opening. The hood has a pronounced, raised central section and two side channels which channel air from the two vents in the bumper. At the very heart of the car is the 3902 cc turbocharged V8 engine. Thanks to a maximum power output of 670 CV and smooth, progressive torque delivery in the higher gears by the Variable Torque Management system, the 488 Spider sprints from 0 to 100 km/h in 3 seconds flat and from 0 to 200 km/h in 8.7 seconds. Every Ferrari has its own unique and distinctive soundtrack and the 488 Spider is no exception. The new V8’s soundtrack is full and powerful even at low speeds and increases in volume and clarity as revs rise, underscoring the engine’s exceptional responsiveness, torque and performance. The Ferrari 488 Spider’s cockpit was designed to underscore Ferrari’s Formula 1-inspired philosophy of creating a seamless relationship between driver and car: the commands not clustered on the steering wheel are on the wraparound satellite pods which are angled directly towards the driver. The new lighter compact dashboard also curves around the cockpit and features ultra-sporty air vents. The 488 Spider’s new door panels are the fruit of meticulous work that centered around quality and attention to detail. They are now more comfortable to the touch and the armrest is more ergonomic. Aside from integrated Apple CarPlay, the Ferrari 488 Spider also boasts a new Sport infotainment system with the display still part of the instrument cluster in the driver’s line of sight, following the cockpit’s philosophy of ergonomic and aesthetic integration with the various functionalities immediately at hand.